So you're cured of Hepatitis C - What next? So you've made it! SVR12 and you are cured of Hep C. Maybe you battled your insurance company for access to the medications. Maybe you sourced generic medications yourself. Every 6 months arrange for an ultrasound of your liver and an AlphaFetoProtein (AFP) blood test. This is suggested by both AASLD and EASL because cirrhosis carries an increased risk for the development of HepatoCellularCancer (HCC). Prior to treatment that risk was about 3% per year, and with SVR12 it falls to less than 1% but it does not fall to zero. With any form of cancer early detection allows for early treatment and cure, so keeping an eye out for this issue is a great way to protect your health. 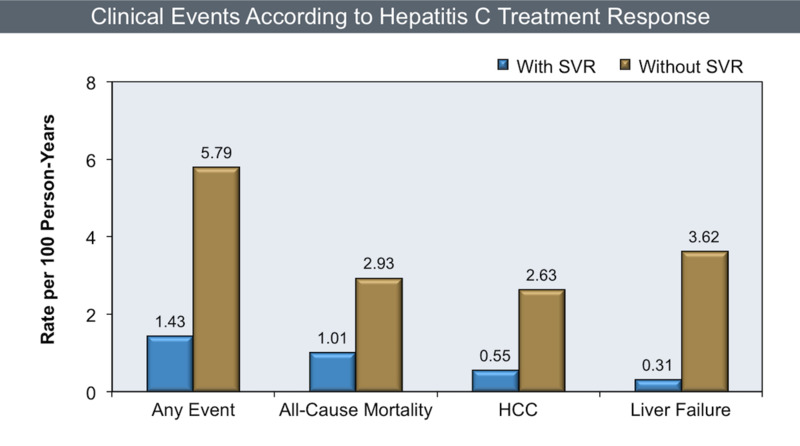 If you look at the impact of SVR you can see quite clearly why treatment is probably the single best thing a patient with Hepatitis C can do for their health. MAVIRET® (glecaprevir/pibrentasvir) was listed on the PBS in Australia today. AbbVie is pleased to announce that MAVIRET is to be listed on the PBS on 1 August 2018 for the treatment of chronic hepatitis C virus (HCV) infection in adults. MAVIRET is a new 8 week pangenotypic treatment for treatment-naïve non-cirrhotic HCV adult patients. We have the power to FixHepC, but the real question is... Do we have the willpower? This was how Dr James Freeman ended his presentation at the World Hepatitis Summit in Brazil. You can watch the full presentation on YouTube. In essence, if we applied the same effort to HCV as we do to HIV this epidemic could be over within a single year. Currently, we treat 18 million patients with one year's supply of multiple antiviral drugs. That would translate to 72 million 3 month treatment courses - enough to treat every man woman and child with HCV. We still have the enormous challenge of finding those patients in time, but we clearly have the funding capacity and the industrial capacity to get it done. One year, that's all it would take. Hepatitis C is a disease that can make you feel old before your time. While there is no doubt that treatment with the new generation of direct acting antivirals like Harvoni is by far the best option this is not available to everyone, either because they don't qualify under their insurance, don't have insurance, or can not afford the $1250 cost to get generic hepatitis c treatment. This guest blog was written by the Outreach Team at Disability Benefits Help and outlines how you can get help if you have become too sick to work. This includes both financial support and the potential to access to subsidised treatment. If you have been diagnosed with Hepatitis C and will be unable to work for at least one year, you might be eligible for Social Security disability benefits. The Social Security Administration (SSA) offers financial resources for people who are unable to work for an extended period of time due to a serious illness. Hepatitis C will not automatically qualify, and unfortunately, most people with the condition will not be approved. Severe cases will qualify though, meaning you could be eligible for payments to help with your daily living expenses, as well as access to health insurance to pay for your hepatitis treatments. Social Security disability benefits are never temporary. They’re only available for people who expect to have a disability that lasts at least a year. This means that if you’ve recently been diagnosed with hepatitis C and have a good prognosis with minimal liver damage and a strong treatment plan, you likely won’t qualify. You also will not qualify if you’ve had hepatitis C for years but your symptoms are managed well. The SSA will not consider you to be “disabled” unless you are completely unable to earn at least $1,170 per month (in 2017). If you expect to be finished with treatments within a few months, or your condition is well managed, it’s not advisable to apply for disability benefits. For those with severe liver damage, medical qualification is possible and potentially guaranteed, depending on your liver function. The SSA evaluates all hepatitis C applicants under its own medical guide, known as the Blue Book. The Blue Book is a manual listing all potential disabling conditions, plus the symptoms you’d need to qualify. Hepatitis c would fall under Section 5.05: Chronic liver disease. Chronic liver disease is arguably the most complicated listing in the Blue Book. There are actually seven ways to qualify under this listing, and all require medical tests evaluating your serum levels, blood quality, and more. The Blue Book was written for medical professionals and is available entirely online, so please review the listing with your hepatologist! He or she can help you navigate the guide and determine if your hepatitis c meets any liver disease listings. If you require a liver transplant, rest assured that your liver disease will qualify. You will also automatically qualify for disability benefits for at least 12 months after a liver transplant surgery. Most people can apply for Social Security disability benefits online. If you’d prefer, you can also apply in person at your closest office by scheduling an appointment at 1-800-772-1213. There are over 1,000 offices across the US. You’ll usually hear back from the SSA within three to five months. If your application is denied, do not give up! 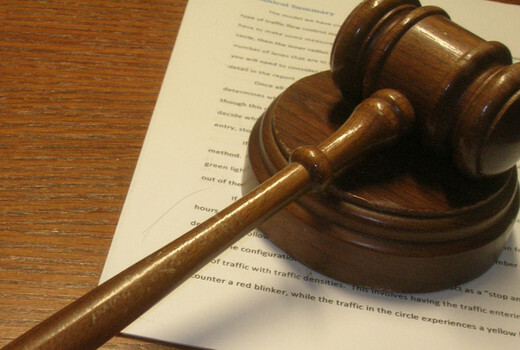 The SSA has a thorough appeals process, which allows you to fight your claim. While just 30% of applicants are initially applied, nearly 70% are eventually approved after pursuing their claims further. "To our knowledge, this is the first large-scale study to demonstrate the effect of newer DAA regimens upon survival. Treatment with 2 commonly used DAA regimens, PrOD and LDV/SOF, was associated with significant improvements in survival within the first 18 months of treatment, compared with demographically and clinically similar untreated HCV-infected controls. Treatment with either PrOD or LDV/SOF was associated with a 57% reduction in mortality, and attainment of SVR was associated with a 43% reduction in mortality….Benefits of treatment at a population level are expected to be substantial…..similar benefit can be expected with other DAA-based regimens"
Interferon-based regimens are associated with a substantial survival benefit for persons infected with hepatitis C virus (HCV). Survival data with direct-acting antiviral agents are not available. We conducted this study to quantify the effect of paritaprevir/ritonavir, ombitasvir, dasabuvir (PrOD) and ledipasvir/sofosbuvir (LDV/SOF) regimens upon mortality. In the Electronically Retrieved Cohort of HCV Infected Veterans (ERCHIVES), a well-established national cohort of HCV-infected Veterans, we identified HCV-infected persons initiated on PrOD or LDV/SOF, excluding those with human immunodeficiency virus, hepatitis B surface antigen positivity, hepatocellular carcinoma, or missing HCV RNA or FIB-4 scores. For each case, we identified a propensity score–matched control never initiated on treatment. Primary outcome was survival. Outcomes were assessed using frequency of events, Kaplan-Meier curves, and Cox proportional hazards regression analyses. We identified 1473 persons on PrOD, 5497 on LDV/SOF, and 6970 propensity score–matched untreated persons. Treated persons were more likely to be obese and have cirrhosis, but less likely to have stage 3–5 chronic kidney disease (CKD), alcohol or drug abuse or dependence diagnosis, and anemia. The proportion of persons who died was higher in the untreated group compared with either treatment group (PrOD, 0.3%; LDV/SOF, 1.4%; untreated controls, 2.5%; P < .001). A significantly larger percentage of treated patients survived to 18 months of follow-up, compared with untreated controls (P < .001). In multivariable Cox regression analysis, treatment with either regimen (hazard ratio [HR], 0.43; 95% confidence interval [CI], .33–.57) and attainment of sustained virologic response (SVR) were associated with significantly lower mortality (HR, 0.57; 95% CI, .33–.99). Treatment with PrOD or LDV/SOF and SVR are associated with a significant mortality benefit, apparent within the first 18 months of treatment. In the world of Hepatitis C, the chances of getting the medical insurance to cover the high costs of your drugs comes down to a fibrosis score of an individual patient. In the US for example, Medicaid providers will in many cases cover the $94,500 Hepatitis C drug Harvoni costs only to the sickest patients, determined primarily by the measure of liver scarring or fibrosis score. Efforts are being done to expand the insurance coverage to all Hepatitis C patients but it is an uphill battle. It is our hope that in some years, insurance companies will include Hepatitis C coverage in the majority of healthcare plans; however, Hepatitis C patients can't afford to wait for years on end to get the medicines. FixHepC Buyers Club works much quicker. We can supply every Hepatitis C patients, regardless of fibrosis score, with an affordable Hepatitis C drugs (sofosbuvir, ledipasvir, daclatasvir, ribavirin). For everybody in need of Hepatitis C drugs, please do contact Dr. Freeman via email or phone and you will be able to discuss the proper course of treatment and how to obtain the medications. A federal judge has ordered Washington state’s Medicaid provider to cover expensive hepatitis C drugs for all patients with the liver-destroying disease, not just those who are sickest. Up till now, the coverage included only the patients with the most problematic fibrosis score. This has left thousands of patients in Washington alone without the access to the medications; not many could fetch up more than $80,000 for the medicines. U.S. District Court Judge John C. Coughenour granted a preliminary injunction Friday that forces the state Health Care Authority (HCA) to halt a 2015 policy that restricted access to the drugs based on a fibrosis score, a measure of liver scarring. Hepatitis C drugs are expensive; so much so that many of health insurance companies would go down if they had to cover the expenses of all Hepatitis C patients. This system is very problematic because the insurance will only cover Hepatitis C expenses for the sickest of patients. Everybody else with Hepatitis C has to wait for his or her liver to be ruined enough (according to fibrosis score) to qualify for Hepatitis C drugs coverage. We all know that Hepatitis C is a deadly disease if left untreated. Why should only patients with a bad fibrosis score get the medical coverage? This is exactly what Washington Judge John C. Coughenour pointed out. Eventually, even people with the best fibrosis score will have their liver damaged beyond repair and looking for help then will be too late. FixHepC has organized itself as a safe establishment to procure the necessary Hepatitis C medications to every patients. For further instructions on how to get the low-priced Hepatitis C medications, please contact Dr. James Freeman here. The injunction was a response to a class-action lawsuit filed in February on behalf of two clients of Apple Health — and nearly 28,000 other Medicaid enrollees with hepatitis C.
The two patients, a 53-year-old Seattle woman and a 47-year-old Lakewood man, were prescribed the drug Harvoni to treat their hepatitis C infections. But they were denied the drug, which costs about $95,000 for a 12-week treatment, because of its cost, the complaint said. The injunction orders HCA to begin covering Harvoni “without regard to fibrosis score.” The judge ruled that the agency’s policy was not consistent with existing state and federal Medicaid requirements that drugs be dispensed based on medical need. “For people who have been living with this disease and feeling like there’s no hope if they can’t get this cure, this is life-changing,” said Ele Hamburger, a lawyer with the firm Sirianni, Youtz, Spoonemore and Hamburger, which filed the lawsuit. Co-filers included Columbia Legal Services and the Center for Health Law and Policy Innovation at Harvard Law School. It’s not clear how soon Medicaid patients with hepatitis C may begin filling prescriptions for Harvoni and other direct-acting antiviral drugs. The ruling orders all parties to report back within 60 days. HCA officials are reviewing the injunction, a spokeswoman said. But the state Medicaid director, MaryAnne Lindeblad, estimated in a letter to the U.S. Senate last fall that paying for hepatitis C treatment for all Medicaid clients in Washington would be three times the agency’s current $1 billion drug budget. Medical guidelines had previously supported limiting the drugs to the sickest patients, but that changed last year. Experts in liver treatment and infectious disease now agree that drugs such as Harvoni should be used to treat all patients, including those with mild disease. Waiting for your liver to have a bad enough fibrosis score for insurance company to cover Hepatitis C costs is literally playing with your own life. We can help you to get the Hepatitis C medications within a month. Send us an email and we will help you get over Hepatitis C once and for all. In 1961 JFK uttered the immortal lines "ask not what your country can do for you - ask what you can do for your country". With the passage of time, the idea we should all put something back in seems increasingly lost. We have at our fingertips the tools to rid the world of Hepatitis C and are separated from that only by corporate avarice. Gilead Sciences are asking for more than the entire annual PBS medications budget, used to treat all Australians for all diseases, to treat a single disease forecast to kill half as many people as breast cancer by 2030. If this medication pricing trend continues unabated you can foresee the day we invent a cure for cancer, but people still die because only a fortunate few can afford access. Parallel importing is a tool that has been used before to level the playing field, most notably around the pricing of HIV medications. $1000 a tablet for something that costs $1 to produce and is available overseas for $10 does not make sense. It’s time to draw a line in the sand and make it clear patient rights deserve equal protection to patent rights.